Supergirl picks up on Reign’s mission to sever any connection she might have to Sam’s life as Kara and Lena still struggle to trust one another. Last week was a big episode in a lot of ways. Two of the Worlkillers were dispatched, Reign tripled her power level and Ruby became her next target. Things are escalating while still taking stock of the personal relationships and using them to encourage viewers to invest in what’s going on. 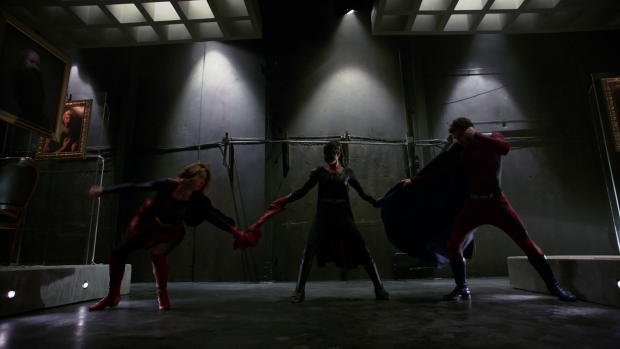 This is something that Supergirl at its best does really well while other shows fail to measure up. This episode is largely framed as a race against time, at least in the beginning. Reign is going after Ruby because she needs to be rid of the one weakness that might allow Sam to regain control. It’s a sound strategy on Reign’s part while also counting as a really brutal mission given that Ruby is a child and putting children in mortal danger is generally considered to be a really bad thing. I suspected from early on that Sam and Ruby’s relationship would be significant when it comes to the villain story and I was definitely right though in fairness it’s not that difficult to figure out. Creating a villain who has a split personality and giving the Human side of that a daughter to anchor that Humanity means that it will be exploited at some point for both story and character purposes. It’s just good writing to bring things like that in and adds far more to what would otherwise be a fairly standard “hero fights villainous opposite” type story. Early on in the episode there is a real sense or urgency that keeps the momentum going strong. Team Supergirl know that Reign will go after everything that represents Sam and her Humanity but don’t know how long they’ve got or where to start. The two targets are Ruby and Sam’s adoptive Mother Patricia so they split up to ensure maximum possible protection for both of them. Kara and J’Onn go to protect Patricia and Alex goes for Ruby which makes sense on a narrative level as Alex has the strongest relationship with Ruby. Patricia isn’t all that interesting as a character and her relationship with Sam doesn’t really work. Her last appearance gave us a baseline for their connection by slightly exploring how strained their relationship became when Patricia kicked Sam out for getting herself pregnant. The background work isn’t strong enough to justify this decision which means that Patricia back-pedalling on it is a meaningless gesture that doesn’t work. She reveals that it was obvious to her that Reign and Sam were one in the same because Sam used to draw symbols like the one on Reign’s chest. Couple Reign’s appearance with the fact that Patricia already knows that Sam is an alien and you have a fairly obvious conclusion that’s easy to draw. There’s not much to say about Patricia’s involvement in the episode other than she apparently feels guilty about the way she treated Sam and regrets never meeting her granddaughter. Her attempt to get through to Sam on the grounds that she’s a good person and needs to protect Ruby feels completely unearned and is met with the predictable reaction from Reign. She even makes Kara promise to tell Ruby that her grandmother loves her. It should be a moving exit but it doesn’t land because what little work has been done to develop this relationship is inconsistent. Much better is Ruby and Sam’s relationship in terms of how it comes into play towards the end of the episode. Reign relentlessly stalks Ruby who only has Alex for backup at first along with an easy to pass gauntlet of traps designed to test a Kryptonian’s powers just like in the first Christopher Reeve Superman movie. I have to mention how much I liked how that scene was deployed as it was nearly identical to the equivalent scene in Superman making for a fun reference that made sense given it took place in Lex Luthor’s mansion and was deployed for a variation of its intended purpose. Reign going after Ruby makes for a really tense sequence because it’s clear that it’s only a matter of time before Reign catches up with her and the prospect of a mother -even though it isn’t directly her- killing her own daughter is immensely tragic. 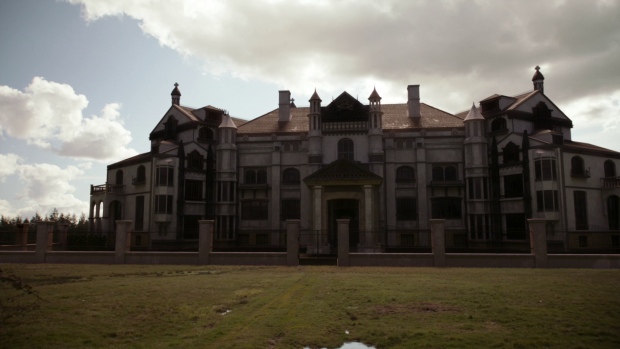 Having it be Ruby that brings Reign to that location works really well because it was framed as an emotional decision rather than a practical one. Ruby is constantly confused and terrified throughout this episode because she gets the feeling that everyone in her life is being less than truthful with her. She has been told that her mother is sick but hasn’t been told what the ailment is which leads her to jump to the conclusion that it’s connected to the Pestilence that infected people in National City. Alex continues to lie to Ruby even though those lies are unconvincing in an attempt to alleviate her fears. She consistently fails to see that these lies are only making Ruby more alarmed and fails to consider how intelligent she really is. It’s definitely a mistake on Alex’ part and that’s good because flawed characters are more interesting. For all her talk about wanting to be a mother she has no idea how to actually be one as evidenced by the way she treats Ruby in this episode. Her heart is in the right place and keeping her safe is top priority but the way she goes about it is inherently flawed and damages their relationship somewhat. There is also the really stupid decision whereby a Secret Agent leaves her phone on a table unlocked so that anyone can pick it up and use it but that’s somewhat beside the point. If Alex had been honest with Ruby and trusted her to handle the truth of the situation then she wouldn’t have been in any danger. Once again, Alex making that choice isn’t a flaw in the episode because it feeds into her desire to become a mother and marks the next stage in that arc so as a character beat it works very well. Ruby finds out that her mother is Reign and calls Alex out on her lies before Alex points out that her mother is trapped inside Reign rather than being Reign. It’s a lie by omission and technicality but still a lie and has probably damaged Alex and Ruby’s relationship at this point because of the lack of trust that was shown. It’s really compelling character drama and gives Alex a regret to mull over in the future. The moment that Ruby realises the truth is really powerfully done. She goes from wanting to be helpful by picking up the Gatling Gun to being terrified and helpless following that realisation. The way Reign advances on her with no compassion or empathy in her eyes is positively chilling and really highlights the differences between the two personas while showing that Sam is buried deep within Reign. Reign does hesitate but it has nothing to do with Sam’s connection to Ruby and everything to do with her own sense of justice. In her first appearance it was established that she fights evil in her own brutally lethal way and punishes the corrupt. Since Ruby doesn’t fit her definition of evil then there’s no way that Reign can justify harming her without compromising those principles. It’s enough to make her hesitate long enough for Mon’El to subdue her using some makeshift Kryptonite bullets. There is still time in the season to explore Reign’s complicated sense of morality. Having her captured creates plenty of opportunities for characters to have relatively safe conversations with her where the depths of her version of justice can be explored. She is a mirror for Supergirl and has been since her first appearance so I would like to see Reign ask Kara difficult questions that challenge her own morality while also delving more into her purpose on Earth. It’s possible that Reign herself is somewhat being controlled by the Kryptonian hologram that tells her what her next objective is. The fact that the hologram told her to wipe out Sam’s ties to her Humanity despite this clashing with Reign’s sense of justice interests me and makes me wonder if there’s more conflict to come around that. Reign’s hesitation comes after J’Onn and Kara go to M’Yrnn because he has experience making White Martians change their mind about certain things such as killing him. He is the one who encourages Kara to appeal to Reign’s code of honour rather than try to force Reign to accept hers. It’s a different outlook on the conflict and proves to be enough. This isn’t nearly as interesting as the exploration of M’Yrnn’s illness. It has escalated to the point that his memories are all but gone outside of periodic spells of lucidity. J’Onn has a really open conversation with Kara about how helpless he feels and how much he wants to help his father while also knowing that he can’t. Given how far the condition has progressed it’s looking likely that there are some difficult choices for J’Onn to make in the near future as M’Yrnn simply won’t get any better. The real star of the show here is Lena. Last week put her in direct opposition with Supergirl in a satisfyingly complex way. Kara and Lena both had points of view that made sense while also being flawed in their own way. I much prefer arguments with no right answer because then the side that the viewer is on comes down to personal opinion. Arguments like that show tremendous respect for the audience on the part of the writers and allows nicely complex situations to develop. Kryptonite is the source of the tension this time. Lena wasn’t honest with Kara about how much Kryptonite she has in her possession nor did she inform Kara that she had the ability to make it. A conversation with James encourages Lena to come clean with Kara about what she has because Reign needs to be stopped and she can supply a much needed advantage in that conflict. James points out how reasonable Supergirl is and guarantees that going to her with the truth while treating her like an ally will yield a positive result. This proves to be inaccurate as Kara reacts very negatively to the fact that Lena has Kryptonite. She has a complex about it since it’s the only thing that can kill her except from super powered aliens and all the other things that have threatened her life over the years. This strong exception she takes to someone who isn’t her having possession of Kryptonite feels like it comes from nowhere to a certain degree because it has been used in the past without her being overly concerned about it. For example she used to train with Alex with low levels of Kryptonite present to even the odds and force Kara to work on her skills. I get that the idea is supposed to be that she doesn’t really trust Lena to be in possession of it because it’s a vulnerability that can be used against her at any point in the future. The uncertainty associated with that is what she’s concerned about rather than the Kryptonite itself. That doesn’t really come across but it is there in the subtext. Lena’s beef is with Kara herself and the assumption that she has the right to dictate what others do. The accusation of her having a God complex hits hard because there might be an element of truth to it. 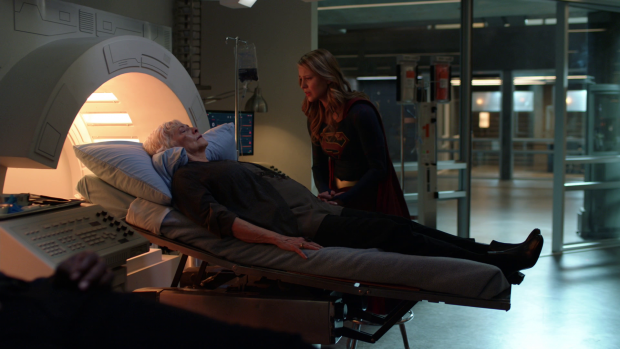 Ultimately Lena’s Kryptonite proves instrumental in capturing Reign and she is put back in Lena’s facility because it is the place that has been proven to contain her. Kara does apologise in the end because she recognises what Lena was able to bring to the table and sees that there does need to be trust between them for them to work effectively as a team. It does feel like a quick turnaround for Kara but the argument clearly isn’t over yet. The best scene in the episode was the elevator scene where Lena talks to Kara in her civilian identity. In general this show doesn’t do enough with Kara’s double life but this is one of the strongest showings of that in recent memory. Lena bluntly and honestly tells Kara that she is only working with Supergirl for the good of the world in general. She has taken a strong dislike to Supergirl and actually has valid reasons for doing so. Kara asking James to break into her lab to look for Kryptonite was an unforgivable betrayal. She likens using that personal relationship against her to something that her mother would do which makes Kara noticeably uncomfortable. Lena is forcing her to confront the truth of her decisions and how much pain they cause without being able to defend herself because she is keeping that distance from Lena by hiding her identity. Even more problematic is that Kara is playing the role of Lena’s best friend in this scene so has no choice but to listen to what she has to say rather than offer an argument against it. Lena is opening up to her in a way that she never would with Supergirl. It’s really interesting to have this separate dynamic between Lena and the Kara’s two identities. To have them be vastly different from one another makes it all the more compelling and I can’t help but wonder how Kara’s friendship with Lena will be affected by this being in the back of her mind anytime they interact. I also wonder if being forced to listen to what Lena had to say caused Kara to think about what she has done and reconsider her future approach. This is really fascinating and deep characterisation that I definitely want to see more of. 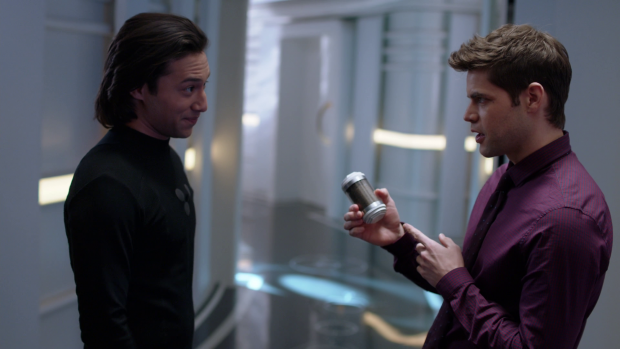 Mon’El decides to stay in the present day for the time being by the end of this episode. Brainy gives them the all clear to return to the future because there’s no sign of the Blight in the sleeping Legionnaires so that means they can safely return and enjoy a more stable future. 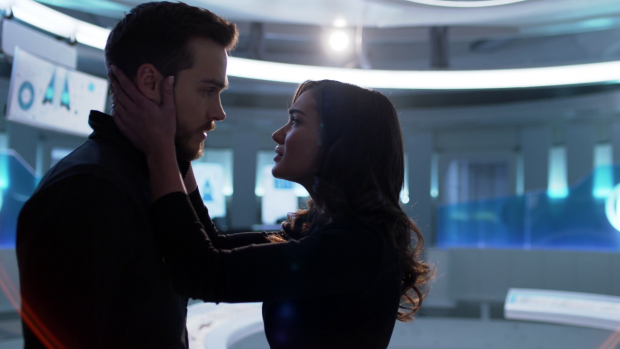 Naturally their departure is a slow one to allow time for Mon’El to reconsider his decision to stay before Imra practically forces him to stay because it’s clear to her that he has unresolved feelings that he needs to figure out. As far as she’s concerned if he decides to return to the future after helping Kara defeat Reign then she can feel confident that he has completely chosen her. If he doesn’t return then she will apparently understand. It’s mature in a really plot convenient way that makes their entire relationship come across as little more than an obstacle that keeps Mon’El from Kara. I suspect we’ll have an episode or two of Mon’El feeling guilty about his feelings before deciding that Kara is the one he really wants. The whole contrivance around percentage success rates doesn’t work really as if there’s such a strong chance of winning now that Mon’El has stayed then a lot of the jeopardy has been removed. A strong episode that focuses on interesting dynamics in different ways. Reign going after everything that tethers Sam to her Humanity is a solid strategy that plays out in different ways. 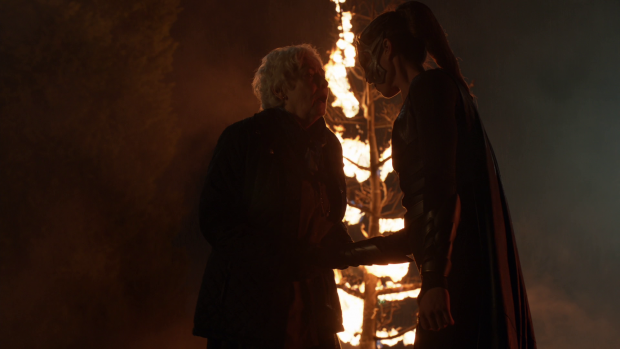 The connection to her adoptive mother feels forced and underwhelming but all of the work with Ruby is really strong as it highlights an interesting character flaw in Alex while showing how strong Reign’s influence is. Kara appealing to her code of honour is a really nice touch because it suggests that Reign’s agenda might conflict with the Kryptonian hologram since killing Ruby isn’t something she would typically do based on her own version of morality. Exploiting this come from advice from M’Yrnn while his condition escalates to the point of being difficult to manage indicating that J’Onn has a number of hard decisions to make in the near future. Lena is the star of the show this week as she comes into conflict with Kara over Kryptonite. The argument on Kara’s end feels a little forced but it makes enough sense for it to work because the argument is so strong, Lena accuses Kara of having a God complex and she isn’t entirely wrong. 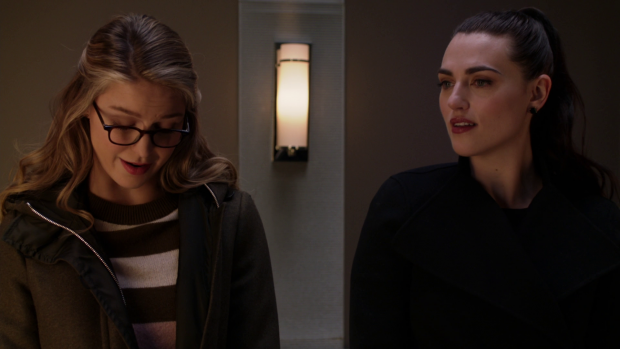 The conversation in the elevator is excellent because it highlights some uncomfortable truths to Kara and makes her realise how her actions have made her best friend feel. It makes for really complex character drama and is a great use of Kara’s double life. Mon’El’s decision to stay in the present works in a way that makes it convenient for the plot but sets up Imra as a simple obstacle keeping Mon’El from Kara.